Last night was quite and unexpectedly epic evening. After our morning pottery excursion, and afternoon hike, I had reservations to see a Whirling Dervish Ceremony. At 50 TL it was a bit pricey, but I have always been interested in this human phenomena, so I decided it was worth it. And I think I chose correctly. The Dervishes went through an intricate ceremony of iterations of bowing and spinning, encompassed by bigger rotations around the stage. The rotations symbolize the connection amongst all beings, from the smallest atom to the largest planet. Everything revolves, both in movement through space and cycles through time. Though they moved quickly, the Dervishes seemed relaxed and meditative, a feeling that filled the energy of the room. During the show the Dervishes, in their white flowing gowns, seemed to glow with some inner light…but then I realized that the dim cavern was actually lit by black lights. The white gowns were glowing beneath the black light!! While the cavern may be several thousand years old, clearly the technical system was quite a bit newer. It was a nice touch all the same. 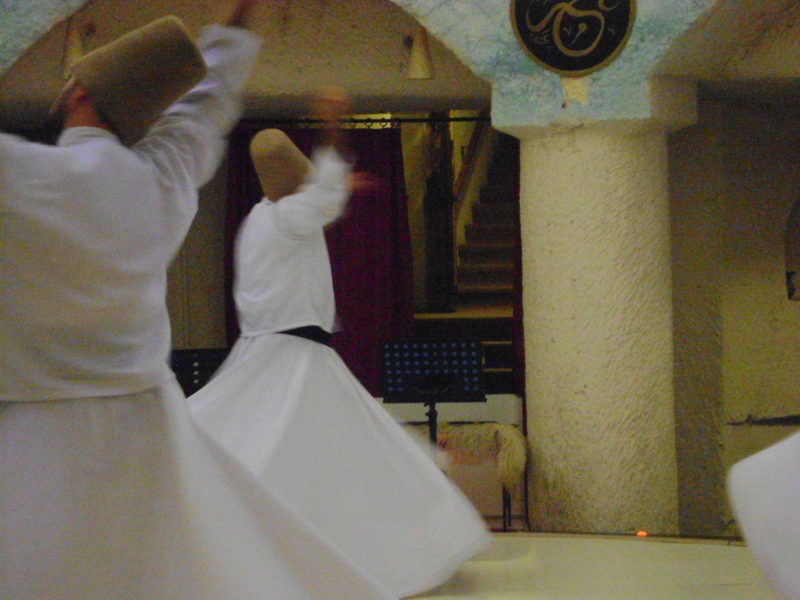 The rotating Dervishes seek a state of love and ecstasy. 1. In generosity and helping others, be like a river. 2. In compassion and grace, be like the sun. 3. In concealing others faults, be like the night. 4. In anger and fury, be like the dead. 5. In modesty and humility, be like the earth. 6. In tolerance, be like the sea. 7. Either exist as you are, or be as you look. After the ceremony, I peacefully returned to the hostel, where I met Maree. We had plans to visit a restaurant we had passed that afternoon which advertised live music. The restaurant was charming, with more of the low tables and large pillows. Here, I ordered the local Cappadocia wine, a dry red, and was very pleasantly surprised. It was very mild but palpable. Not extremely complex, but not at all tasting of vinegar. I’ll certainly be taking a bottle or two home to share. Though live music was advertised, it seemed not forthcoming. A little sad, but enjoying the environment all the same, Maree and I stayed for a few drinks and snacks. Eventually, we were the only remaining guests, and the restaurant workers settled down across the room from us with a Saz and some hand drums and wooden spoons. They played several nice songs while we listened appreciatively. Then the Saz player- Charlie- asked if we would like to join them! Though I have a little experience with hand drums, it can be intimidating to play songs you don’t know with people you’ve just met. All the same, I happily took the offered Dumbek and settled on a pillow across from the Saz player. Maree took a shaker. We played some songs with them and after a few minutes of loosening up we even sounded somewhat good. Certainly nothing to go on the road with, but also nothing to make a musician’s ears bleed. I have to say, music is a wonderful thing. It can bridge cultures in an instant. It is a way to bond with friends and strangers and not a word needs to be uttered. It inspires both unity and humanity; creativity, originality, and connection. And it’s just plain fun! I don’t know what travel tips to offer from this experience. This was one of those lucky moments that can’t be planned for, trained for, or scheduled. They can only be hoped for. The moments when you can bond with strangers, not as travelers or hosts, but as equals finding themselves in the same place at the same time and sharing a brief moment of simple happiness. I can only hope that you can find these moments too, when you’re traveling and even when you aren’t.